Ingolstadt – 100 years of Audi. An exceptional anniversary is being celebrated with an exceptional timekeeper – the Tachoscope, the new Audi centennial watch. It embodies the incomparable spirit of the brand: tradition and innovation, design and precision, sophistication and perfection. 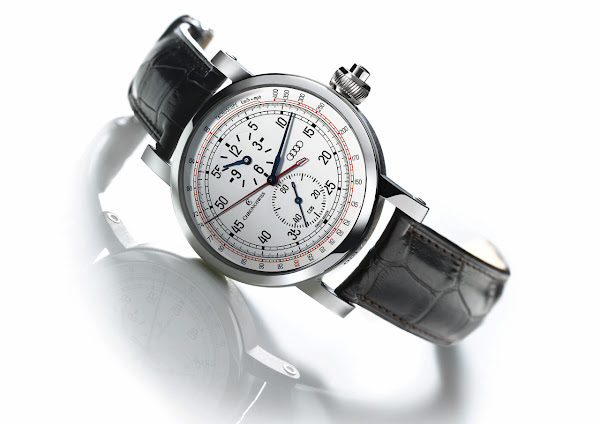 A masterpiece of watchmakers’ artistry, this push-piece chronograph with tachometer function has a manufacture caliber and a unique design. “The Tachoscope is a tribute to 100 years of Audi,” explains Rupert Stadler, Chairman of the Board of Management of AUDI AG. “This timekeeper is a masterpiece of the watchmaker’s craft, a product of passion for mechanical precision. And, it symbolizes the strong roots of our powerful brand.” Audi Design was responsible for styling this exclusive timekeeper, in collaboration with Chronoswiss, its Munich-based development and production partner. 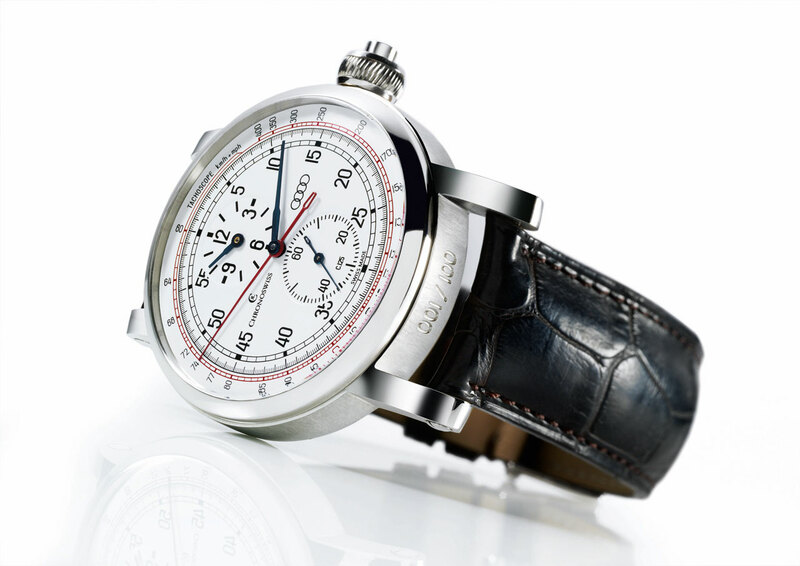 Like Audi, Chronoswiss is dedicated to precision and the utmost quality. screws (Audi Design), water resistant up to 3 atm, incl. at the setting mechanism; mid-section with horns and brushed finish; upper housing section, push-piece, mid-section surface and beveled edge all polished to a high gloss. Movement: Manufacture caliber C. 125 (enlarged rotor with dia. 28.00 mm and ring with pearled finish around the movement), automatic winding mechanism, dia. 28,00 mm (11 ¾“), 30 jewels, Incabloc shock rotection, 35-hour power reserve, 3 Hz., 21,600 A/h (oscillations), ratchet mechanism (installed on the dial face side) with kinetic operation, central chrono wheel mounted on ball bearings (for the first time in chronograph design), skeletonized rotor designed by Audi, individually numbered and engraved with the years 909 - 2009 and the four Audi rings logo. Dial: Dial with enameled face and printed Arabic numerals (special Audi font); timer, hours and minutes recessed, Tachymeter scale with 1/6 second increments (360 graduations), blued steel hands, shape: “Type C”. Limited edition: Total series of 100 timepieces; 65 in white gold and 35 in platinum. Delivery scope: The Tachoscope is delivered in a box with a black piano finish. 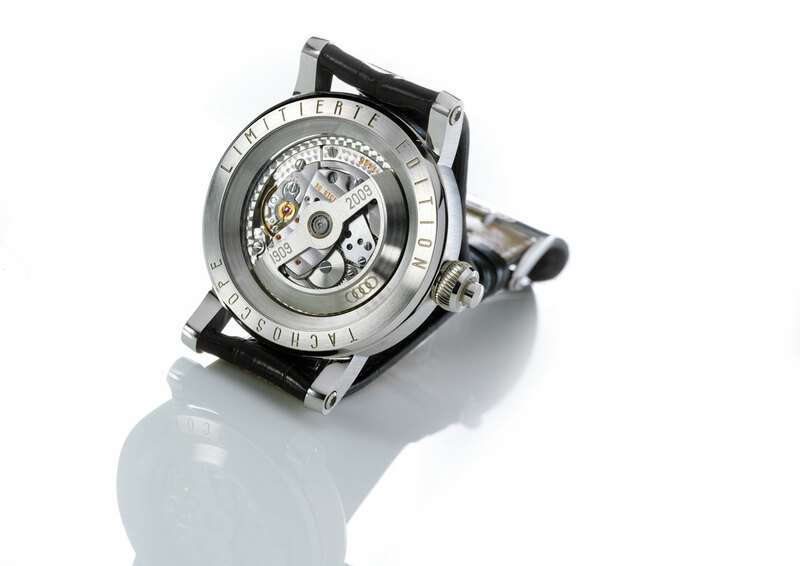 Included are also a watchmaker’s loupe and a special screwdriver for changing the watchband.